Not many bands arrive so fully formed that they teeter on the brink of greatness with their very first EP, but that's precisely the bracket that Glasgow's Holy Esque fall under. Their inaugural self-tiled release (my review of which you can read here) is finally available on iTunes as of today, and suggests that even at this early stage they're veering towards something exceptional. It's a predicament that's made all the more startling by the fact that they've been in existence for little over a year, but already outside voices calling them the best new band in Scotland seem to hold a fair bit of weight. The quartet - which consists of Pat Hynes (vocals/guitar), Keir Reid (keys), Hugo McGinley (guitar) and Ralph McClure (drums) - play an emotive branch of indie rock which does plenty to recall the genre's current heavyweights whilst maintaining enough identity to hold it's own among such illustrious names. 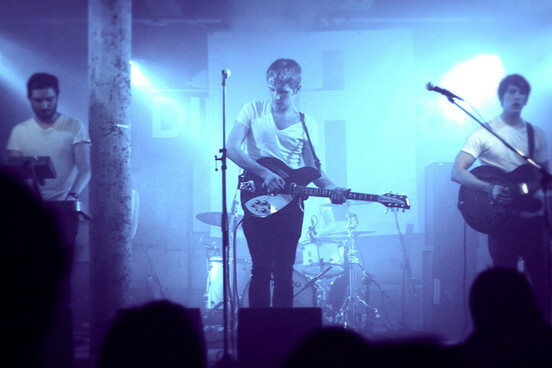 Fans of The National, The Walkmen and Titus Andronicus should all find something to savour in their overbearing shoegazing anthems, while Hynes' husky vocal style will no doubt entice a proportion of the WU LYF crowd, some of whom will have witnessed them opening for the Mancunians earlier this year. What's more important, though, is that they bear all the hallmarks of a band that's here to stay, and once they've fine tuned their sound you wouldn't bet against them becoming a serious force in the indie world. Holy Esque is out now on iTunes. 'Ladybird Love' and 'Rose' are available for streaming.